SOR Clicks and FX Vol.1 – delivers loops and single sounds that will enhance your production instantly while matching seamlessly. Tags: Ambient, Deep House, Electro House, House, Minimal, Tech House, Techno. 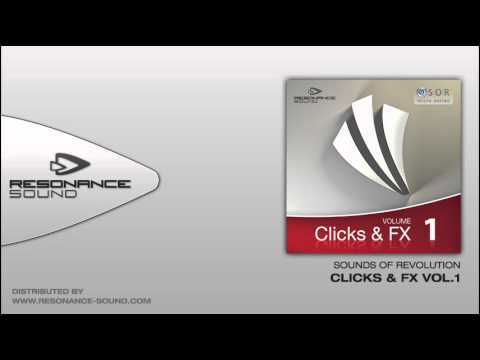 Oliver Schmitt aka SOUNDS OF REVOLUTION (SOR) continues his successful “SOR micro series” with “Clicks and FX Vol.1”, distributed through Resonance Sound. You know the story: Your next track is almost ready and you`re searching for that one sample to throw your mix into new dimensions to get the crowds pumping, but your current library of sounds lack enthusiasm?! This is where this sample pack comes into play! SOR Clicks and FX Vol.1 will spice up any electronic music production instantly and effortlessly. Being part of SOR`s Micro Series, this selection of contemporary elements delivers loops and single sounds that will enhance your production instantly while matching seamlessly. Add sounds like trendy clicks or exceptional FX-samples to sharpen up your tracks and make them more inspiring. All 75 click-loops have been produced with 127 BPM. In addition with 354 loop elements and 75 FX-sounds, SOR Clicks and FX Vol.1 makes the ideal solution for up-todate Minimal, Techno and Tech House tracks. The library is delivered in a choice of established formats and therefore immediately ready to use. A particular feature of SOR Clicks and FX Vol.1 is the Loop-Elements – loop fragments, ready to be effectively triggered from your sampler to create animated effects. Real enrichment for any groove!